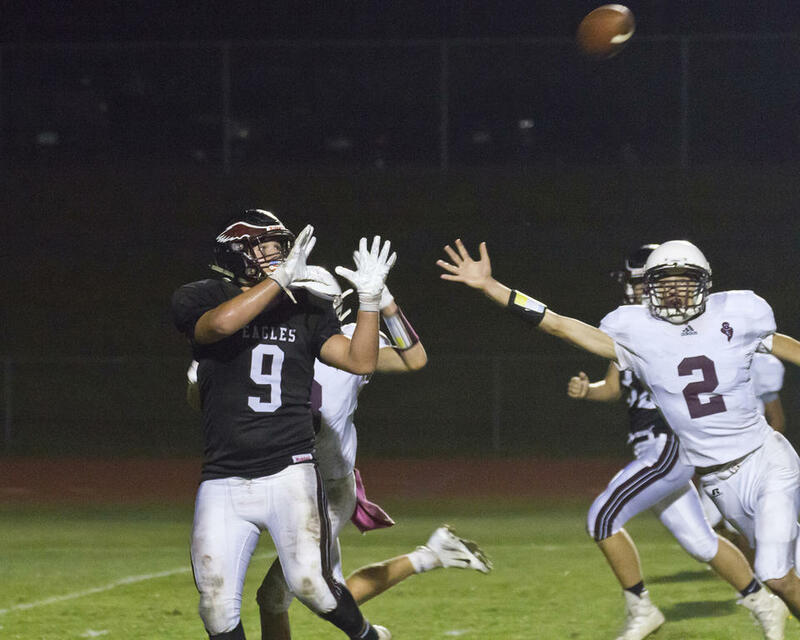 WINDHAM—Eagles sophomore QB Harrison Boyle connected with senior receiver Garrett Peeples for a pair of flashy pass TDs when Edward Little came to town on Friday night, September 14. 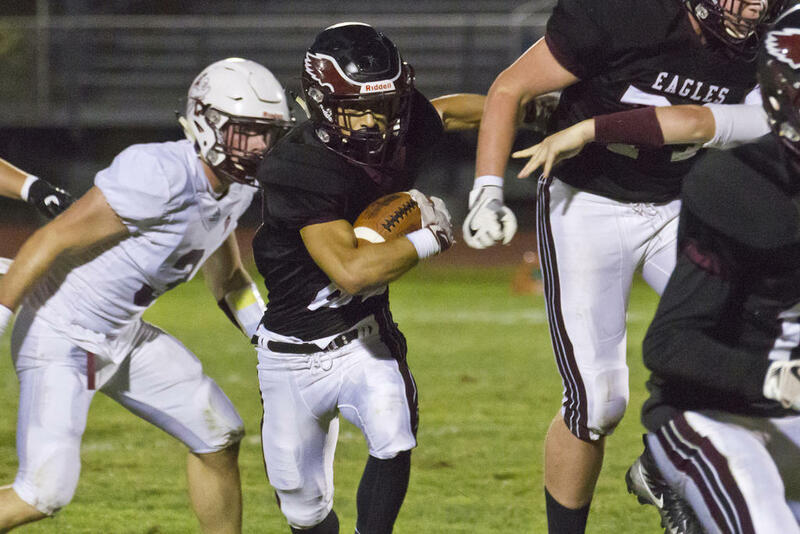 But those efforts – and more – couldn’t keep Windham afloat against the Red Eddies, who emerged victorious from the bout 41-21. 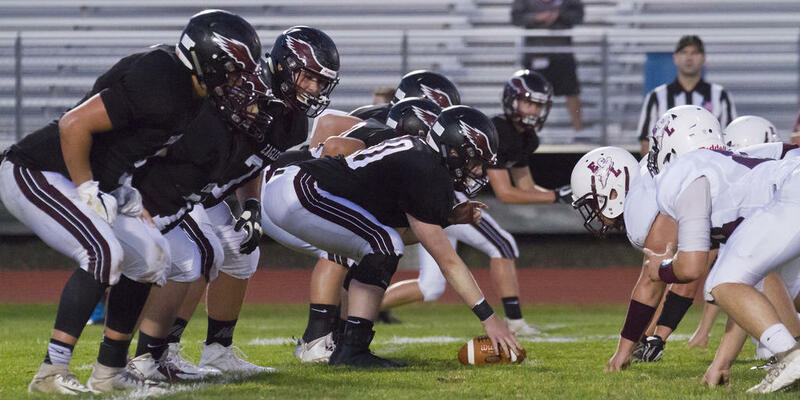 Windham dropped to 0-3 on the year with the loss, a rematch of last autumn’s semifinal bout. Thus far, the team has come up short vs. No. 2 Portland 49-0 and No. 5 Bangor 14-0. So their work against the Eddies in fact represents a huge improvement – especially given just how young they are. Windham won the coin toss at the outset of the action, and deferred possession till the start of the second half. EL’s opening drive chewed through more than five of the first 12 minutes – but earned them naught. 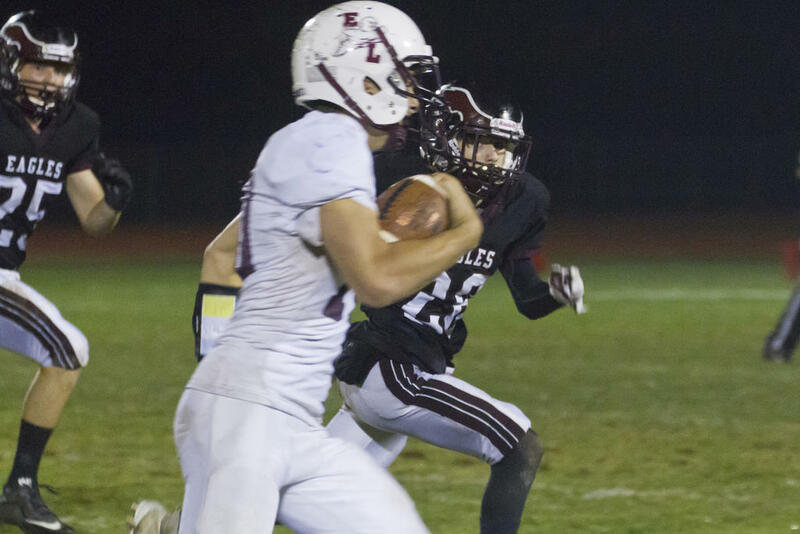 The Eddies battled all the way to fourth and four at the Eagles’ 19, only to turn over control when Windhamite George Butts laid a huge tackle on EL QB Leighton Girardin for a loss of two. But the Eagles’ own first drive also turned up no points, and the team soon found themselves setting up to punt. Unfortunately, kicker Brady Afthim slipped on a low snap and accidentally downed the ball; possession returned to the Eddies at the Windham 19. Given another shot at good field position, EL wasted little time capitalizing. 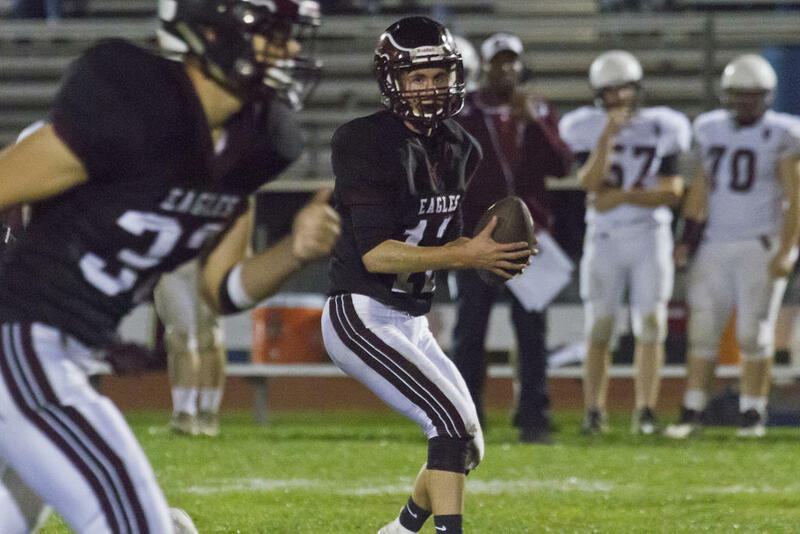 Girardin capped a short series with a 10-yard scramble leftward, over the Eagles’ goal line. Misha Boulet added the PAT for 7-0. Windham pulled even on their next drive. Boyle hit Peeples for some pass yardage early in the push, and Stuart Salom contributed a short dash. The team actually ran out of downs and punted, but an EL player touched the ball without downing it, allowing the Eagles to recover and extend their possession. Salom tacked on a couple more skitters – an eight-yarder and a three-yarder – to inch his boys to first and 10 at the EL 15; from there, Boyle hit Peeples with a pass TD over the middle. Kicker Liam McCusker split the uprights for 7-7. The Eagles turned in a ferocious red-zone stand early in the second quarter. Senior defensive lineman Braxton Cassidy finished it, plowing through the middle and dropping Girardin on an EL fourth and goal with inches to go. Girardin, though, would soon get his revenge, breaking away from the Windham 29 on the Eddies’ next series and scrambling for his boys’ second score of the night. He would later add their third score as well: After teammate Bobby Tremaine blocked an Afthim punt to set EL up at first and goal on the Eagles’ one, Girardin carried the ball home and ratcheted the scoreboard to 21-7. By this time, though, EL had hashed 35 points of their own. And while they would add yet another score before time expired, Windham would not, leading to the 42-21 result. Windham’s next bout is on the road at Scarborough. 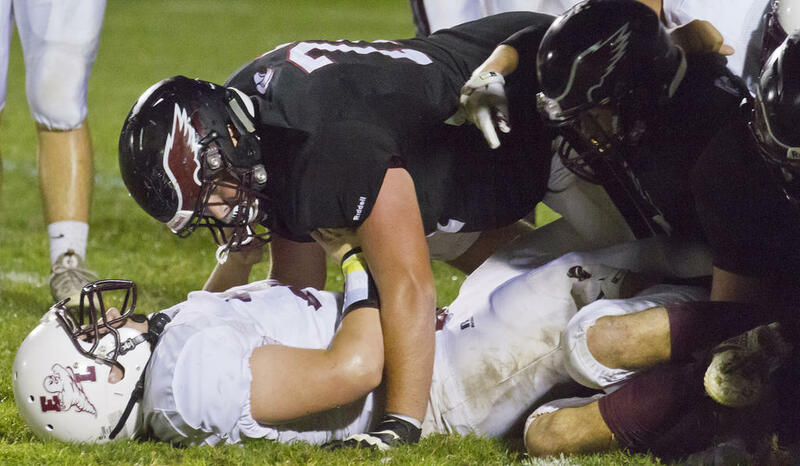 The Storm – 3-0 thus far this fall – ran roughshod over the Eagles in last year’s State Final. It may be another tough go for Windham this time around, but no doubt they’ll continue to learn and take yet another step forward. Happily, Perkins reports that, even without a win under their belts quite yet, his boys are in good spirits. “We have some really good leaders that are seniors,” he said, “and they know. They know they’re surrounded by young guys, and they’ve kind of taken it on as their task to teach them the game. And not to get hung up on wins and losses – you can’t; you’ve got to look at the whole picture. Garrett Peeples gets beneath an incoming pass; Peeples would reel in the throw and score for the Eagles. 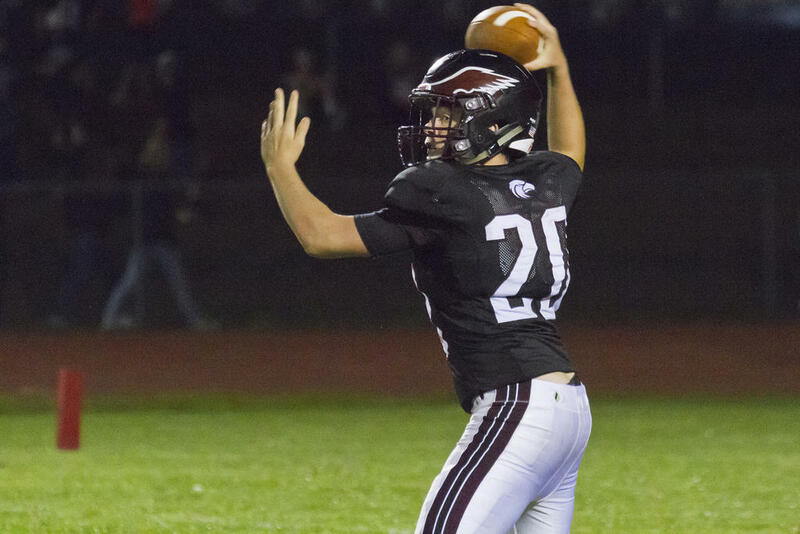 Anthony Gugliuzza stepped in to QB after teammate Harrison Boyle suffered an injury. 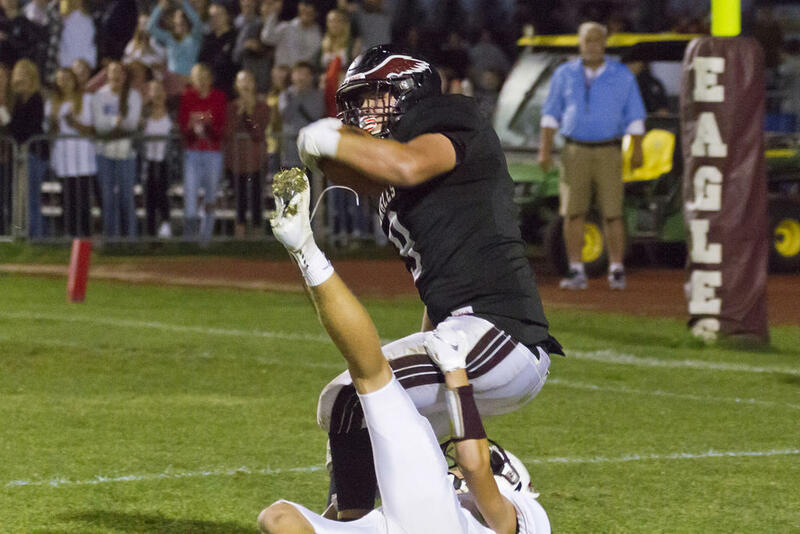 Windham lineman Braxton Cassidy gives an EL opponent the what-for to cap a standout defensive moment – a goal-line stand – for the Eagles. 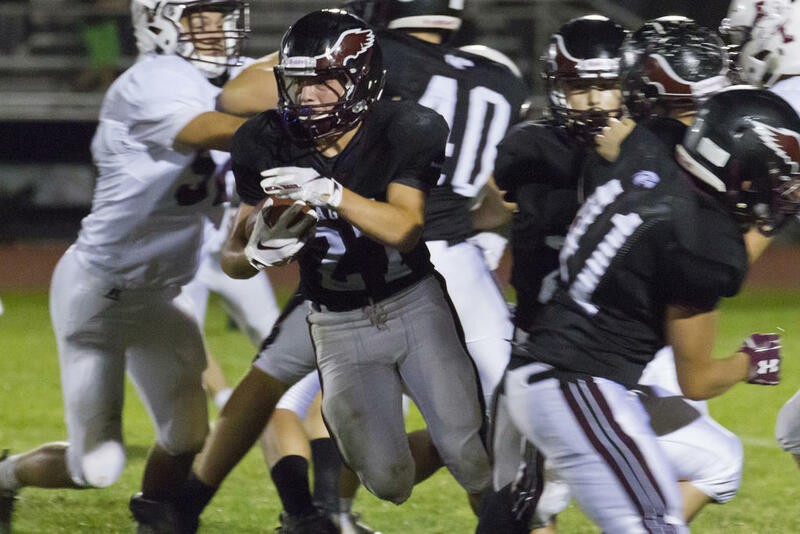 Windham’s Ben Elliot runs the ball in the team’s bout Friday night vs. EL. Windhamite Derek Palow, defending, tracks an EL runner. Harrison Boyle QBs for the Eagles. Stuart Salom is the Eagles’ chief runningback this autumn. Windhamite Garrett Peeples falls over the goalline, scoring an early Eagles TD. The Eagles line up on offense.